I have a definite interest in music that breaks down barriers and creates a unique hybrid of established musical formats. 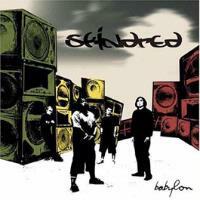 Such a sound is what makes up Skindred's Babylon. The music combines the unlikely sounds of reggae, hip-hop, punk, metal and thrash into an intriguing soundscape. While some of the disc definitely works better than others, this strange amalgamation overall is quite intriguing. Generally they pull it off pretty well, but there are awkward moments. At times they sound a little like Faith No More, but in general there are no easy equivalents. This one is a disc that will be appreciated by those who like challenging, cutting edge music. It's not perfect, but it is definitely very unique. This is just a strange electronic reggae rap introduction that leads straight into the next cut. Mixing nu-metal with reggae and even just a touch of hip-hop, this is rather strange, but very cool. The chorus is especially potent. There are moments that feel a little like Faith No More. Lyrically this is an autobiographical anthem. This is a lot more catchy and less extreme, but very, very cool. I really like this one. While the blend of sounds is essentially unchanged from the last track, this is much more accessible. If you can picture thrash reggae, you come pretty close to the chorus on this one. It drops to a more stripped down hard rocking reggae approach on the verses. This is lyrically a call to end violence. The closing riff is a killer. This is just a short snippet of effects and spoken words. More of a pure ska/reggae cut, this one is a nice change of pace. It still has its metal leaning, but is definitely less heavy than some of the other stuff on show here. A huge change up, this comes in as heavy super aggressive metal. The vocal segment combines reggae with that texture, but overall this one is a super meaty heavier than heavy angry cut. A percussive based oddity, this is kind of cool, but not much. This is another that is more accessible and reggae based. It still manages to rock out, though. Punk, thrash and reggae merge on this frantic cut that again feels a bit like Faith No More. Bouncy, more accessible, more pure reggae makes up a lot of this cut. The chorus has a meaty metallic edge, but a reggae beat and sensibility. This is one of my favorites on the CD and has some killer instrumental textures. Ultra aggressive heavy nu-metal textures dominate this stomper. It still has some reggae elements in the vocals, but overall is a pretty pure modern metal. They include a couple strange mellower bits for a nice change up. An acoustically driven, but still rhythmic balladic textures makes this one both a great change up and one of my faves on the disc. The chorus is very pure reggae and has a killer arrangement. The song lyrically is anti - bullying. This is a spoken interlude. Coming in hard and tasty, a lightning fast reggae rap makes up the main focus on this one. It does have its modern metal elements, though. At times this feels just a little like Nine Inch Nails. A quick electronic intro gives way to a super heavy short metal segment. Then a stripped down reggae arrangement takes it. The metal returns for the killer chorus. The lyrics are adapted from Matthew 24: 4-8. A weird interlude leads to a killer metal/prog metal type instrumental break before the ultra heavy takes it again. This is killer and a great way to end the disc, but it isn't the true ending. After some silence at the end of the last track a cool acoustic based reggae jam takes the disc. This is a definite winner and lots of fun. Be sure not to miss it. Also, play it side by side the full arrangement of the song for an interesting game of compare and contrast.